Laserfiche Workflow is a useful tool for auto-filing documents. If a document’s template and fields include values that coincide with the repository’s filing structure, Workflow can dynamically move documents to their appropriate folders. For many organizations, setting up auto-filing is simple, but it can be challenging for a financial services firm with a large and diverse client base. Assume the following folder structure and template are being used to file client documents. 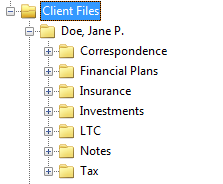 The folder naming convention is “Last Name, First Name, Middle Initial,” and the template includes fields corresponding to each component of the folder name. In order for Workflow to dynamically route documents to the correct folder, the content typed in the fields must match the name of the folder. Since Workflow will also create the folder if it does not exist, the slightest mistake in the client’s name (such as typing “Jim” instead of “James”) could create an unwanted folder containing “missing” documents. You can fix this by implementing list fields, but with such a large client base, this is not practical. 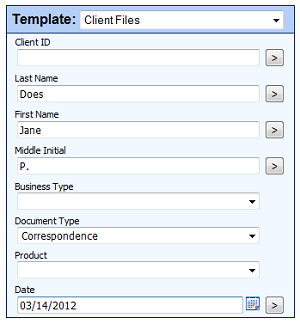 The template you use for your client files must include a field for the unique client ID. The client ID field must be populated for the document prior to the initiation of the workflow. Your root folder for each client must also contain the populated client ID. The template you use for your client files must include field information that could dynamically generate the name of your client folder. 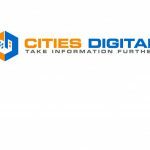 Documents must be fully indexed prior to initiating the workflow. For detailed instructions on how to implement these two solutions, download Cities Digital’s 30-page guide now.